The book that I chose for the flowers I have been holding onto for a long time. It was a gift from my mother and I have been afraid to touch it it is so pretty. Of course, that is ridiculous. I did a cover/title page, so now It’s mussed up and I can move on to fill the pages. After the ink journal is done, I might start an animals only journal. This was the last week for #sketchbookskool. As the first class, this was a great experience. I am not as sad to see it end though, mostly because I need to move on to do some finished work. I have plenty of ideas to work on. 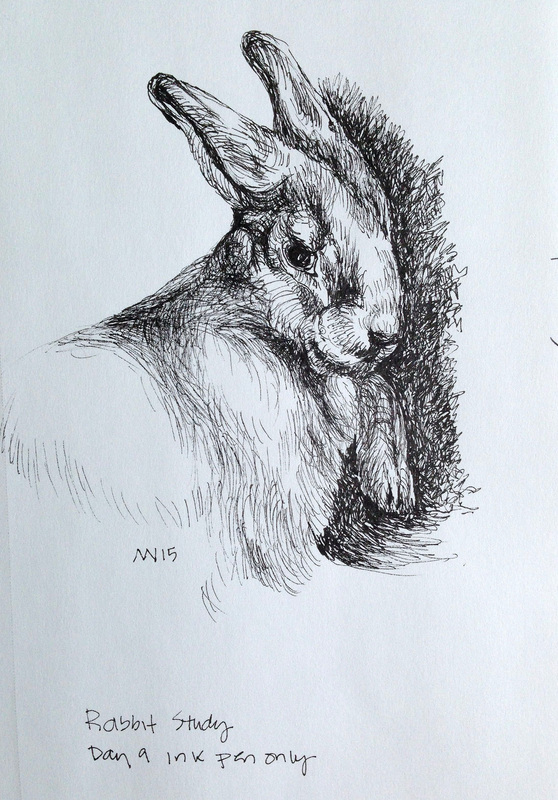 This entry was posted in animal, art, art journal, drawing, ink pen, rabbit and tagged art, art journal, artist, arts, bunny, ink pen, pitt pen, rabbit. Bookmark the permalink.